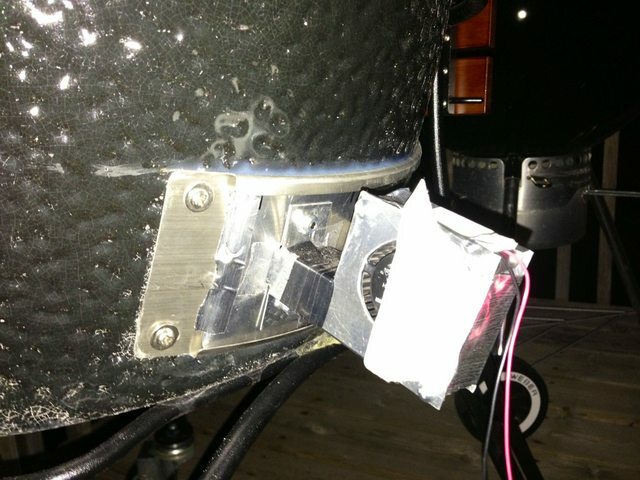 I think that has a lot to do with it, the fact that I have a BGE. I've also had like 4 years to dial in my PID values. The new PID info dialog (press P on the home page when logged in) helped a lot this time. John, Nice to see you built the "air burner" and it is working out for you. It's really a very simple concept, but getting the air distributed more evenly under the coals is a big help in getting your coals to burn eventy. At any rate, it's awesome to see you build one of these, makes me feel like I contributed something to the community..... Happy Smoking! Yeah both at the same time. My fan has gotten somewhat gunky inside over the years I guess so my min fan speed is 25% to make sure it turns on. With your fan installed on the servo but off you can maintain 250F? I was worried about it needing >80% servo just to keep the temperature up. My fan is duct taped on for now though so maybe that causes extra restriction or something. As for the PID value ranges, you definitely don't want anything close to 100 as that would mean the output would be pretty much on/off all the time. P - Here's the easiest place to start. Think about what the acceptable temperature range is for operation. At what point of the pit temperature dropping do you want BWOOP BWOOP giver 'er all she's got, Captain! Divide 100 by that number. That's going to set the lower limit on the P value. For a setpoint 225F with a lower temperature limit of 215, P = 100/(225-215) = 10. That's your ballpark. The faster your grill can change temperatures by changing the output value, the smaller this number should be. In my graph the P was 3 because the blower can really turn things around quickly in there. With just the servo, if I opened it fully it would still take a long time before anything actually happened. Fast response, low P. Slow response, high P.
I - This is where the PID status window on the home screen can really help. Subtract your setpoint from the current temperature, multiply by that by your I constant and that is added to the I value on the pid status window every second. If you have a I of 1 and the temperature is off by 5 degrees, it will add 5% output every second. Because this can compound so fast, you want a pretty small number. The value again depends on the response time of your grill, faster response, lower I (I think, not 100% sure on this one). The easiest thing to do is watch the I value i the PID status as the temperature swings back and forth across the setpoint. It shouldn't have wild swings from like -25% to 25%. The I term's job is to figure out exactly how much output it takes to maintain your setpoint. The value should roughly be the same as the yellow "average blower speed" pip on the blower speed bar on the home screen. Your P value needs to be set at least close before you can tune this, and the value I think should be 0.1 or less always. D - Again the PID status will help here. Your D constant is multiplied by the value dT shows on the status window. dT is the change in temperature over the last minute or so. You want to set your D high enough that you can see the output reversing as your temperature is changing. If you're at the bottom of a temperature swing and the temperature is starting to rise, you should see dT getting larger and the D status subtracting % from the output trying to prevent overshoot. 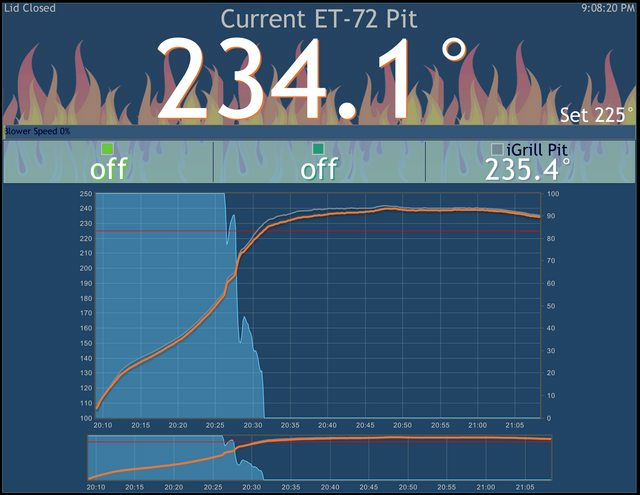 If you set it too high you'll see the output stop before it gets to the setpoint, or the fan turn too early and prevent the grill from cooling to the setpoint. The way to logically think of a good value for this is to ask "If I'm at 223F, setpoint 225F, ad the temperature has come up 1 degree in the past minute, how much do I want to throttle back the output to prevent overshoot?". Like the I constant, this number is proportional to the P constant. Probably best to keep this under 20 unless you're having serious overshoot problems, and that's probably created by the P or I constants being too high. Ralph, thanks! I can always flip it over! I did pizza's the last couple days with a new 25CFM fan, it did a lot better than the stock blower getting up to pizza oven temperatures, but at this point the 3/4" copper tube is limiting the flow a bit much so the fan whistles like crazy and still isn't quite delivering the air I need. I'm hoping this 15CFM fan is a bit quieter and plan on adding a second 3/4" tube to my grill adapter to double the air delivery volume for high heat pizza cooks. I'm looking for a baseline BPID to use with my kamado joe, which is about the same size as the large BGE. The HeaterMeter defaults (BPID): 4, 3, 0.005, 5. Not a great start to the first non test use of the HM on the Kamado Joe. Used 1 weber lighter cube, placed on the indirect plate, closed the lid and let the HM go to town. I've got the top daisy wheel just open a crack, just enough to ensure that smoke doesn't get trapped inside. I'm limiting the natural convection via the fan with some tape, but it's only marginally helping. I can see myself being a good candidate for the servo driven damper. 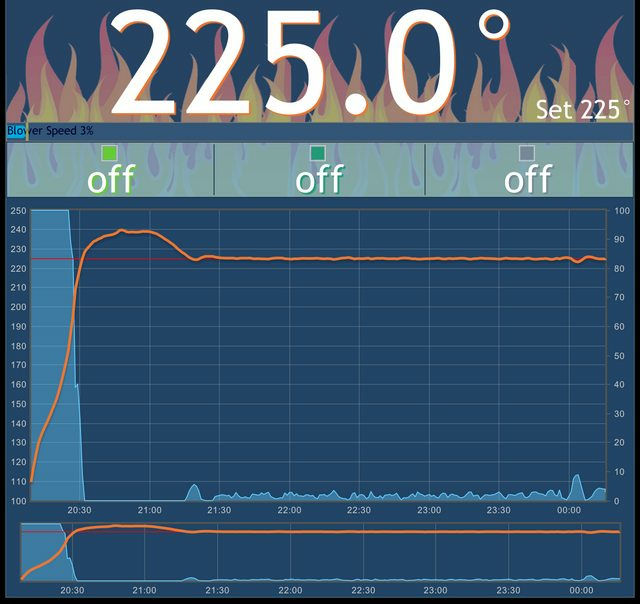 It took about 45 minutes for the overshoot in temperature to come back down to 225. The HM has been holding a pretty steady 225 for about 3 hours now. I opted to let this be a dry run rather instead of an actual cook. Pretty pleased with the way it's holding temps and I'll let it chug away overnight.